Sciblogs | Lime E-Scooters – Avoiding a collision course with public health? Currently introduced in four New Zealand cities, Lime electric scooters (e-scooters) have elicited varied responses. Proponents argue they will help reduce traffic density, thus bringing health and environmental benefits, while critics suggest they risk unacceptable overall harm to pedestrians, users themselves, and to taxpayers, who fund treatments for injuries. In this blog, we consider the public health implications of Lime e-scooters, review how policy makers could maximise the potentially desirable outcomes offered by e-scooters while minimising the harms they pose, and consider wider questions regarding allocation of urban space. The ‘shared economy’, where consumers make private assets, such as rooms or transport, available to others has grown rapidly with enterprises such as AirBnB and Uber now estimated to be multi-billion dollar companies. Companies, such as Lime, have recognised the rapid transformation occurring in the transport sector by making shared transport (e.g., shared cars and cycles) available for hire to potential end-users. But will shared transport respond to problems such as congestion and environmental damage caused by existing transport models? How should we accommodate new information and transport technologies that could change the way we travel? 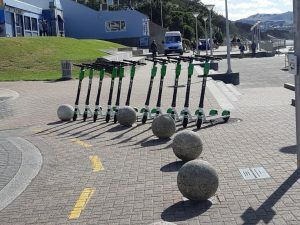 Following its launch of shared e-scooters internationally, in late 2018 Lime expanded to New Zealand where its devices may be hired in Auckland, the Hutt Valley, Christchurch and Dunedin. Potential users download an app, locate an e-scooter using the app map, and unlock a device they would like to use by scanning a QR code on the e-scooter they wish to ride. In New Zealand, users pay $1 to hire the e-scooter and 30 cents a minute, or around $18 an hour. The Lime website states: “Serving cities is at the core of Lime’s mission. From electric scooters to smart bikes, our dock-free smart mobility solutions reduce traffic congestion, promote healthy living and solve the all-important challenge of the first and last mile — all without subsidies or public funding.” This statement suggests Lime will bring important benefits to cities and their citizens, but how valid are these assertions? First, Lime suggests its e-scooters will reduce traffic congestion as people will switch from driving cars or motorcycles and instead use a Lime e-scooter. Reducing vehicle use could not only reduce road congestion but would help decrease air and noise pollution and greenhouse gas emissions, all important health, well-being, and environmental outcomes. The 2018 Lime end of year report provides only limited data on Auckland but states that that 22 per cent of riders reported replacing vehicles (car, shared ride or taxi) transportation with an electric Lime scooter on their last trip. Taking these figures at face value, they suggest potential benefits as reducing inner city car use brings environmental gains (reduced emissions) and potential health benefits (through reduced noise and air pollution). However, we require independent verification of these estimates and need data that also allows us to consider seasonal impacts (i.e., how frequently are they used in winter, for example). Second, Lime suggests their e-scooters promote healthy living, a claim that sits awkwardly alongside one New Zealand media outlet’s description of e-scooters as: “the latest craze for all us lazy peeps who don’t want to walk anywhere, lolz”. Using Lime’s own data, around 80% of Lime trips appear to be replacing walking or cycling (or are recreational trips), which suggests e-scooters may be decreasing physical activity, though the lack of independent data makes Lime’s impact on overall physical activity difficult to assess. Lime e-scooters may also have indirect effects on physical activity, particularly if the speed at which these travel (up to 27km/h) and their density deter people who would normally walk from doing so. Given New Zealand’s high obesity levels and what has been described as a looming tsunami of Type 2 diabetes, devices that reduce exercise may contribute to a critical public health problem. Lime suggests their e-scooters “solve” the first and last mile challenge – in other words, e-scooters provide a way for people to travel to and from public transport (e.g., bus stops and train stations). 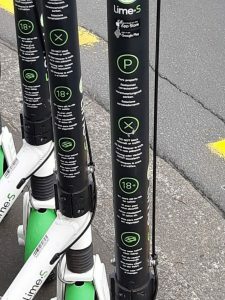 As yet, there are no data to test this claim, though the fact Lime e-scooters are already no longer placed alongside several suburban Dunedin bus stops suggests low uptake as first and last mile solutions. Lime does not mention indirect potential benefits, but we suggest there could be two. First, given debate over where e-scooters should travel and concerns from pedestrians, the advent of e-scooters might encourage City Councils to build more cycle paths, a move that could also benefit cyclists. Second, if e-scooters are moved from footpaths to roadways, some car drivers may become more mindful of non-vehicle road users, which could increase the safety of both cyclists and pedestrians. Despite Lime’s PR fanfare, the proposed benefits are speculative and, until there is better evidence available to test these claims, they should be treated with caution. While evidence of benefits is nascent, evidence of harms resulting from e-scooters is already available. The first and most obvious harm is the injuries incurred by Lime users or that they inflict on others. Recent data from Dunedin alone suggest that each day, the Emergency Department (ED) at the local DHB sees between five to seven people with injuries relating to Lime use. Nationally, total ACC claims for e-scooter injuries at 21 January were reported at over $300,000 representing more than 800 claims. Injuries are not limited to cuts, bruising and scrapes, with 14 crashes reportedly resulting in brain injury or concussion, and critical injuries. International evidence reinforces concerns about e-scooter-related injuries. A recent US study examined 228 injuries sustained by e-scooter riders and non-riders; of these, 27 (10.8%) were aged under 18, despite e-scooter companies requiring riders to be over the age of 18, and only ten (4.4%) wore a helmet. Twelve (4.8%) had a blood alcohol level greater than 0.05% or were considered by a doctor to be intoxicated. An observational study of 193 e-scooter riders undertaken in association with the analysis of ED injuries found 94.3% were not wearing a helmet. For people with visual impairments, who have reduced mobility, or who use wheelchairs or other mobility devices, e-scooters represent a potential hazard when in use and when parked. Despite signage on the scooters and on the Lime website asking people not to block footpaths when parking their scooter, many riders take no heed of this request. Evidence of vandalism creates additional environmental risks. In a pessimistic scenario, increases in new and risky practices, such as burnouts, may increase injury rates (and costs). Tax payers meet the costs of these injuries and ACC claims, which are an added burden to the already over-stretched public health system. In an optimistic scenario, the number of e-scooter crashes reported in New Zealand may decline as users become more experienced riding these devices and safer usage practices evolve (e.g., regular helmet use). However, we need longer term data specific to each region to assess crash trends. Furthermore, assumptions that injuries may decline depend on riders becoming long-term users; observations in Dunedin indicate that many riders are aged under 16 and appear recreational, ad hoc users. Lime e-scooters are clearly not an unambiguous innovation but they are just the latest example in what will be a long line of changes in the transport sector. As such, their introduction raises fundamental questions about how we respond to and incorporate change in the transport sector, and how we allocate urban space. How do cities assess the impact and likely costs and benefits of new transport technologies? In New Zealand cities, e-scooters have simply appeared following limited discussion with local authorities and no consultation with other footpath or road users. Lime has paid nominal fees; for example, Lime reportedly paid the Christchurch City Council $136 for a three-month “mobile trading permit” and reportedly paid nothing to the Dunedin City Council (DCC) as it was not required to procure a permit. A former DCC Councillor, Hilary Calvert, criticised the DCC’s approach, noting that applying the same regulations as those met by businesses displaying footpath signage would net $12,000 in fees each year. Other cities have taken quite different approaches. For example, Gold Coast city authorities in Australia required the immediate removal of Lime scooters pending consultation and analysis of their potential impact. In New Zealand, however, there appears to have been no assessment of whether Lime would reduce carbon emissions or congestion, or of whether the public health benefits claimed would eventuate. Nor is it clear how each city now hosting e-scooters has assessed the introduction of these devices against their own transport plan or the national framework of transport sector outcomes. Nonetheless, the introduction of e-scooters provides an opportunity to consider our wider approach to transport in cities and how effectively existing approaches that focus on mode – cars and roads, pedestrians and footpaths – can accommodate change. Placing people at the heart of inner city development may make it easier to incorporate new technologies that do not fit existing classifications. ‘Complete Streets’ and ‘Healthy Streets’ outline the thinking that may lead to less contested spaces. However, as that conversation evolves, the specific concerns e-scooters have raised require attention and we need also to consider how to reduce the risks these devices present. Possible measures include requiring e-scooters to travel in cycle lanes rather than allowing them to use footpaths. This approach would reduce the risks posed to pedestrians, although consultation with cyclists may reveal concerns that need attention. Imposing a speed limit (e.g., 10 km/h and modifying e-scooters so they cannot exceed such limits) would also reduce the risks posed to pedestrians (should e-scooters remain allowed to use footpaths) and to riders (should they fall off an e-scooter). Defining main shopping streets and pedestrian zones as e-scooter-free areas would reduce footpath congestion and the hazards caused by e-scooters obstructing footpaths. Requiring e-scooter operators to provide helmets as part of their contract with users, would reduce the risk of head injuries and follow international practice. Finally, introducing fines for underage riders or those making e-scooters available to under-age riders could also reduce accidents. These steps could potentially ameliorate problems observed since Lime e-scooters arrived in New Zealand. However, they should not replace consideration of the more fundamental questions we have outlined. What policies and processes do councils and central government need to ensure equitable regulation that balances commercial innovation and public well-being? How effectively can central and local governments address and regulate new technologies when these fall outside existing policies and allow commercial operators to introduce devices without first participating in a detailed consultation with authorities and the public. More generally, how should we manage the competition for contested inner city public space between various transport modes, outdoor living and the natural world? Statement of non-competing interests: None of the authors have any financial interests in any transport modes discussed in this blog. Trivedi TK, Liu C, Antonio ALM, et al. Injuries Associated With Standing Electric Scooter Use I. JAMA Network Open 2019;2(1):e187381-e187381. Featured image: Luis Tamayo, Flickr CC. Thanks to the authors for a really interesting post. I think it’s important to consider, as the authors do, a variety of different aspects of emerging transport technologies to develop considered and holistic views on their complex pros and cons. In terms of injury and responses to that, it would be interesting to see how injury rates compare to other modes of transport, and to see how many collisions also involve other modes (e.g. collisions involving scooter users and drivers, or scooter users and pedestrians). I think it would also be interesting to consider the equity implications of scooter use; for example, in which neighbourhoods are the scooters most prevalent and most scarce after overnight redistribution?